hey there! yesterday was day 2 down in the books, 22 to go. okay, i might not keep doing that, cause it sounds a little discouraging. but i feel great and don’t have many complaints right now. this advocare 24 day challenge doesn’t seem like it’ll be too rough to stick with. i switched yesterday up a little, moving the 2 hour portion of the workout to the afternoon, which meant ~45 mins of morning cardio. i did Just Dance – Just Sweat and felt like i got a really good workout. 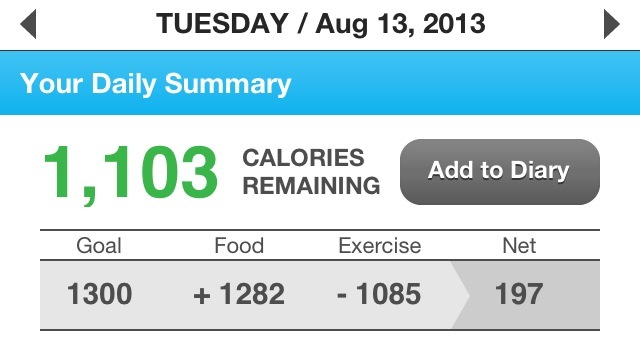 my HRM told me i burned 380 calories, so i’m going to stick with that. i seriously love this kind of cardio; i don’t feel like i’m working out at all, and the whole thing goes by really fast! you see that squiggly line up top? 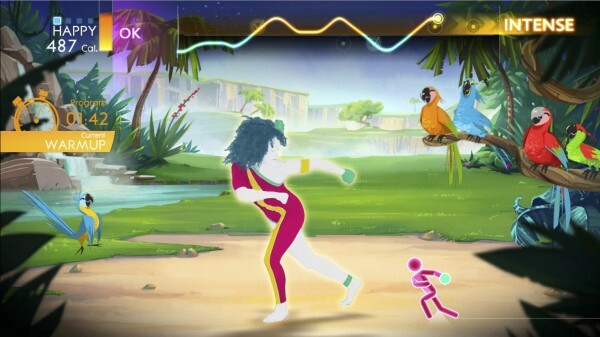 the game incorporates different moves to lower/raise your heart rate. i think that’s a really cool feature. 1:30 p.m. – leftover stuffed peppers topped with frank’s hot sauce. insert 2 hours of weight training (chest) and cardio here. 9:30 p.m. – herbal cleanse tablets + protein shake which consisted of GNC Pro Performance chocolate protein, almond milk, and ice cubes. daily water intake: 150 oz. *can i please talk about these liquid aminos for a second? i’ve never tried them before and i’m IN LOVE. i’ve tried other products from this company with no complaints, but for some reason, i had never picked up this product. 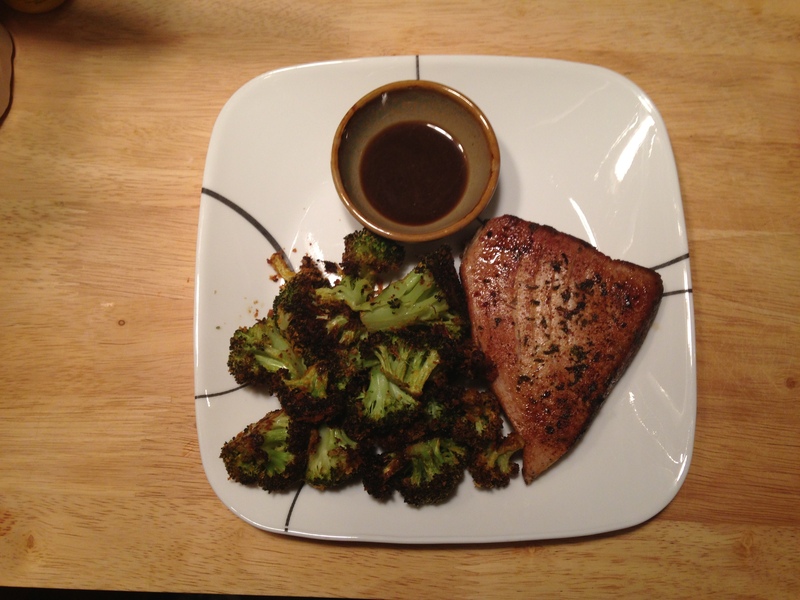 i had pretty much stopped using soy sauce altogether because the taste was so salty i couldn’t stand it. this is the perfect balance and still tastes like soy sauce. i added some wasabi in there for an extra heat factor, and the combo was nothing short of amazing. thoughts on the products? same as day one.. the plan is easy to follow, the fiber drink isn’t the greatest, the cleanse wasn’t too harsh. thoughts on my day? did you happen to notice the time dinner occurred? that’s SUPER late for me. here’s why it happened: i don’t get off work until about 5:15, so by the time i was changed and ready at the gym, it was around 5:45 and then i didn’t finish until 7:30. then, i had to run to the grocery store and buy some stuff to make dinner for a co-worker (she’s undergoing chemotherapy right now, so we set up a ‘meal train’ and my food was due today). by the time i got home and put everything away, it was 8:15.. my dinner was simple, throw it on the pan to roast or sear, but i also had to make BBQ chicken and pasta salad. so, needless to say, i didn’t eat until 8:45. not only was i STARVING after that workout, i really hate eating so late; i’m old and like to get into bed by 10pm and i like to let my food digest before i lay horizontally for several hours. i think from here on out, i’ll be getting my long workout done in the morning, so all i have is quick cardio in the afternoons. even though i wasn’t happy with how late dinner happened, the rest of the day was pretty good. i’m starting to get a lot more energy, i turned down a piece of Costco cake after lunch (progress), and i would still rather lift instead of cardio. i need to find something to replace my edamame snack, because i’m already super bored with it. any suggestions will be appreciated. sorry if this is all repetitive, and i wont get offended if you stop reading. this really helps me document everything so i can look back at what’s working and what’s not. i also realize this is about documenting weight-loss and you haven’t heard anything about that. i’ll write something up at the end of the cleanse, then at the end of the burn phase. it’s going to take all i have to make those numbers public. the only person that knows that number right now is myself and my doctor. it’s actually giving me anxiety just thinking about it now, so i’ll leave it at that. Q: Do you have a set dinner schedule or does it vary from hour to hour? i am a much happier person if i can get dinner in around 6:30 or 7p.m. anything after that, i start getting cranky and anxious.